Passing by St Mary Redcliffe yesterday, I had a good look at the flag [Diocese of Bristol] and it isn't 3:5 - it's almost certainly 1:2. 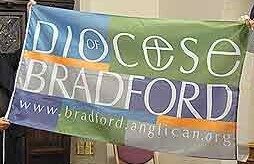 I'm not suggesting that all C. of E. diocesan flags are 1:2. There was a programme on television last night ("A Passion for Churches", BBC2) about St Mary's, East Raynham, Norfolk, which included a shot of the flag of the Diocese of Norwich flying from the tower. This seems to be 3:5, though it does show the shield taking up more of the height of the canton than we have in [some of] the images [on this page]. This being unregulated England - ratios can vary. Passing by St Mary Redcliffe yesterday, I had a good look at the flag and its dimensions are almost certainly 1:2. The flags flying from Anglican Churches in the Provinces of Canterbury and York have been suggested by the Earl Marshal of England. As I understand it this means that the flag from Bristol as given by Andre is correct. The mitre and other parts of a full achievement of arms are not meant to be in the canton, from my reading of the rules. There was a programme on television last night ("A Passion for Churches", BBC2) about St Mary's, East Raynham, Norfolk, which included this shot of the flag of the Diocese of Norwich flying from the tower. This seems to be 3:5, though it does show the shield taking up more of the height of the canton than we have in our other images on this page. (The indistinguishable shield can be seen on the diocesan website at www.norwich.anglican.org/the_diocese.htm. At Diocesan Church House in North Hinksey, Oxford, they fly a St. George's Cross flag defaced in the upper hoist with the logo of the Diocese [top flag] and not the shield from its arms [middle image]. This flag is not flown every day, rather on holy days and so on. As far as I recall, the one used on the flag is black. Their coat of arms can be viewed at http://www.oxford.anglican.org/detail.php?id=1242 at the bottom of the page, with a blazon. It is a white flag with a red St. George cross. In the upper hoist is the coat of arms of the diocese. The diocese of St. Albans is the one north of London. The blue shield is divided by a golden (=yellow) saltire. The whole is superimposed by a sword in natural colour pointing to the top. The sword is topped by a golden coronet, maybe one of a count, with pearls on its tops .The shield is topped by a golden mitre and flanked by two yellow ribbons. Source: I shot this photo on 5 May 2007 in Harpenden. It is a white flag with a red St. George cross. In the upper hoist are ten red balls in Pythagorean tetraktys-formation, i.e. 10 balls triangular 4 over 3 over 2 over 1. 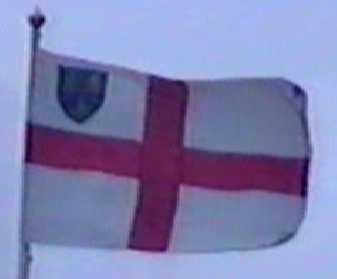 Source: I spotted this flag on top of Worcester cathedral in August 1999. The 10 red balls are placed in a silver shield topped by a silver mitre.